In a 16-year long study, using several of ESO's flagship telescopes, a team of German astronomers has produced the most detailed view ever of the surroundings of the monster lurking at our Galaxy's heart — a supermassive black hole. The research has unravelled the hidden secrets of this tumultuous region by mapping the orbits of almost 30 stars, a five-fold increase over previous studies. One of the stars has now completed a full orbit around the black hole. By watching the motions of 28 stars orbiting the Milky Way's most central region with admirable patience and amazing precision, astronomers have been able to study the supermassive black hole lurking there. It is known as "Sagittarius A*" (pronounced "Sagittarius A star"). The new research marks the first time that the orbits of so many of these central stars have been calculated precisely and reveals information about the enigmatic formation of these stars — and about the black hole to which they are bound. "The centre of the Galaxy is a unique laboratory where we can study the fundamental processes of strong gravity, stellar dynamics and star formation that are of great relevance to all other galactic nuclei, with a level of detail that will never be possible beyond our Galaxy," explains Reinhard Genzel, leader of the team from the Max-Planck-Institute for Extraterrestrial Physics in Garching near Munich. The interstellar dust that fills the Galaxy blocks our direct view of the Milky Way's central region in visible light. So astronomers used infrared wavelengths that can penetrate the dust to probe the region. While this is a technological challenge, it is well worth the effort. "The Galactic Centre harbours the closest supermassive black hole known. Hence, it is the best place to study black holes in detail," argues the study's first author, Stefan Gillessen. The team used the central stars as "test particles" by watching how they move around Sagittarius A*. Just as leaves caught in a wintry gust reveal a complex web of air currents, so does tracking the central stars show the nexus of forces at work at the Galactic Centre. These observations can then be used to infer important properties of the black hole itself, such as its mass and distance. The new study also showed that at least 95% of the mass sensed by the stars has to be in the black hole. There is thus little room left for other dark matter. "Undoubtedly the most spectacular aspect of our long term study is that it has delivered what is now considered to be the best empirical evidence that supermassive black holes do really exist. The stellar orbits in the Galactic Centre show that the central mass concentration of four million solar masses must be a black hole, beyond any reasonable doubt," says Genzel. The observations also allow astronomers to pinpoint our distance to the centre of the Galaxy with great precision, which is now measured to be 27 000 light-years. To build this unparalleled picture of the Milky Way's heart and calculate the orbits of the individual stars the team had to study the stars there for many years. These latest groundbreaking results therefore represent 16 years of dedicated work, which started with observations made in 1992 with the SHARP camera attached to ESO's 3.5-metre New Technology Telescope located at the La Silla observatory in Chile. More observations have subsequently been made since 2002 using two instruments mounted on ESO's 8.2 m Very Large Telescope (VLT). A total of roughly 50 nights of observing time with ESO telescopes, over the 16 years, has been used to complete this incredible set of observations. The new work improved the accuracy by which the astronomers can measure the positions of the stars by a factor of six compared to previous studies. The final precision is 300 microarcseconds, equivalent at seeing a one euro coin from a distance of roughly 10 000 km. For the first time the number of known stellar orbits is now large enough to look for common properties among them. "The stars in the innermost region are in random orbits, like a swarm of bees," says Gillessen. "However, further out, six of the 28 stars orbit the black hole in a disc. In this respect the new study has also confirmed explicitly earlier work in which the disc had been found, but only in a statistical sense. Ordered motion outside the central light-month, randomly oriented orbits inside – that's how the dynamics of the young stars in the Galactic Centre are best described." One particular star, known as S2, orbits the Milky Way's centre so fast that it completed one full revolution within the 16-year period of the study. Observing one complete orbit of S2 has been a crucial contribution to the high accuracy reached and to understanding this region. Yet the mystery still remains as to how these young stars came to be in the orbits they are observed to be in today. They are much too young to have migrated far, but it seems even more improbable that they formed in their current orbits where the tidal forces of the black hole act. Excitingly, future observations are already being planned to test several theoretical models that try to solve this riddle. "ESO still has much to look forward to," says Genzel. "For future studies in the immediate vicinity of the black hole, we need higher angular resolution than is presently possible." According to Frank Eisenhauer, principal investigator of the next generation instrument GRAVITY, ESO will soon be able to obtain that much needed resolution. "The next major advance will be to combine the light from the four 8.2-metre VLT unit telescopes – a technique known as interferometry. This will improve the accuracy of the observations by a factor 10 to 100 over what is currently possible. This combination has the potential to directly test Einstein's general relativity in the presently unexplored region close to a black hole." These observations are the culmination of 16 years of a large monitoring campaign, begun in 1992 at ESO's New Technology Telescope with SHARP. It was then pursued at ESO's Very Large Telescope with the NACO and SINFONI instruments. These two instruments rely on the use of adaptive optics, which allows astronomers to remove the blurring effect of the atmosphere. As the centre of the Milky Way is very crowded, it is necessary to observe it with the finest resolution possible, hence, the need for adaptive optics. 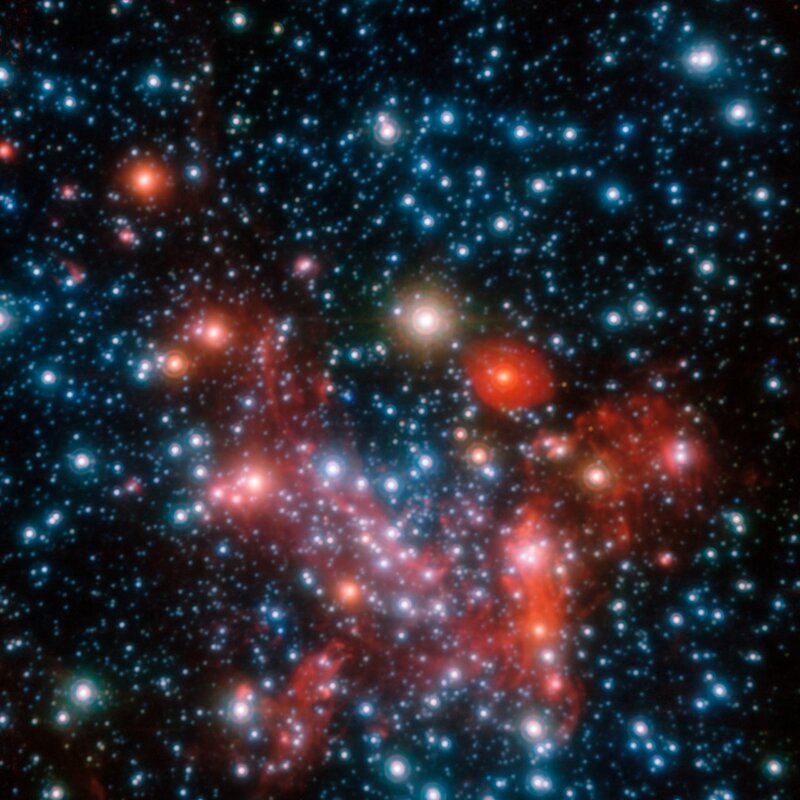 Only radio signals, infrared light and X-rays can reach us from the Galactic Centre. 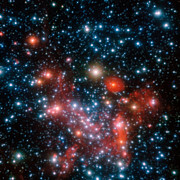 While radio observations show mostly gas and X-ray observatories are sensitive to high energy processes, the infrared allows these stars to be observed. S. Gillessen et al., Monitoring stellar orbits around the Massive Black Hole in the Galactic Center, 2008, Astrophysical Journal, in press. Link to the article. The team is composed of Stefan Gillessen, Frank Eisenhauer, Sascha Trippe, Reinhard Genzel, Thomas Ott (MPE, Garching, Germany), Tal Alexander (Weizmann Institute of Science, Israel), and Fabrice Martins (GRAAL-CNRS, University of Montpellier, France). Reinhard Genzel was awarded the prestigious Shaw Prize in Astronomy for 2008 for this research (see ESO Press Release eso0818). The research team maintains a web page on this project.